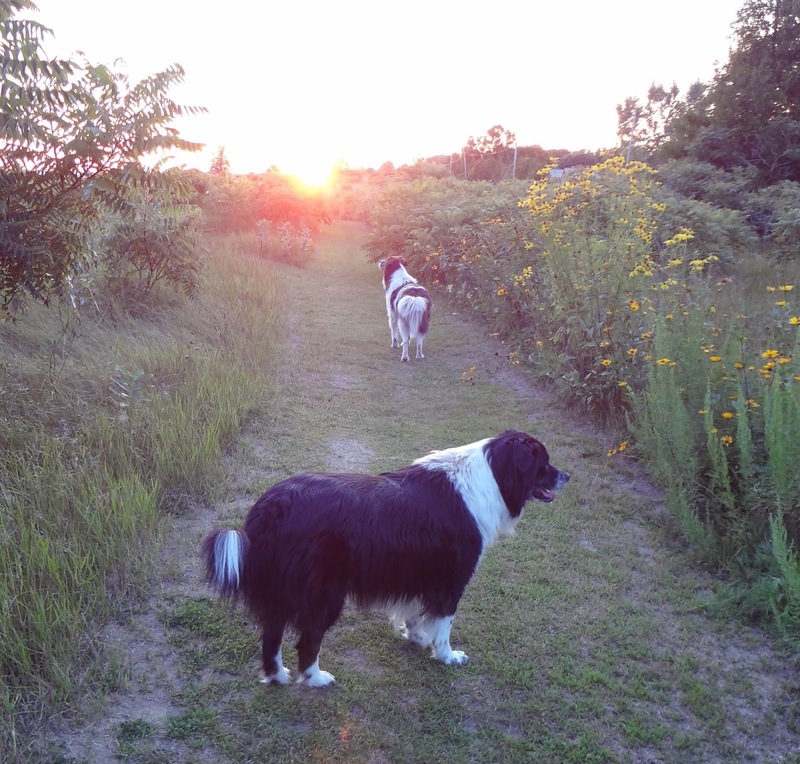 My two rescue mutts, Sally-Forth and Tally-Ho, are wonderful companions. Occasionally, they have even uncovered clues that helped solve mysteries. Sometimes, however, I wish they’d hold back a little on their investigating. Take last night (yes, please, take it!) It was a lovely evening. The sun was setting and the air was almost golden. I let the dogs play in our backyard while I watched them from my comfy lawn chair. They ran, they wrestled, they snuffled in bushes. Suddenly, Tally stopped, raised his head, and tested the air. Sally did the same, and they tore off for a corner of the yard down near the riverside trail. Knowing my yard is securely fenced, I wasn’t concerned. They’d come back into view soon. I was right. Neck and neck, they raced up the hill toward me. Suddenly, Sally dropped and rolled on her back, which isn’t unusual. But then Tally did it, too. And that’s when I recognized that strange smell drifting through the otherwise lovely, golden evening. Sally and Tally had sniffed out a skunk, and it had taken exception to their attempts to herd it. Leaving the dogs outside, I dashed inside, captured my two kittens and shut them into my bedroom, then grabbed a handful of paper towels and ran outside. I patted the dogs’ faces with the towels. Fortunately, the skunk had missed their faces and eyes. I hauled both dogs into the guest bedroom. With difficulty and a bunch of doggie shampoo, I bathed them both. I hated to use their special doggie towels, embroidered with their names and portraits, to dry them, but I didn’t want to use the towels I keep for guests, either. The soggy and overly-fragrant doggie towels went right into the washing machine. During the night, I kept waking to the smell of both skunk and wet dog, but this morning the dogs are fluffy and not terribly smelly. 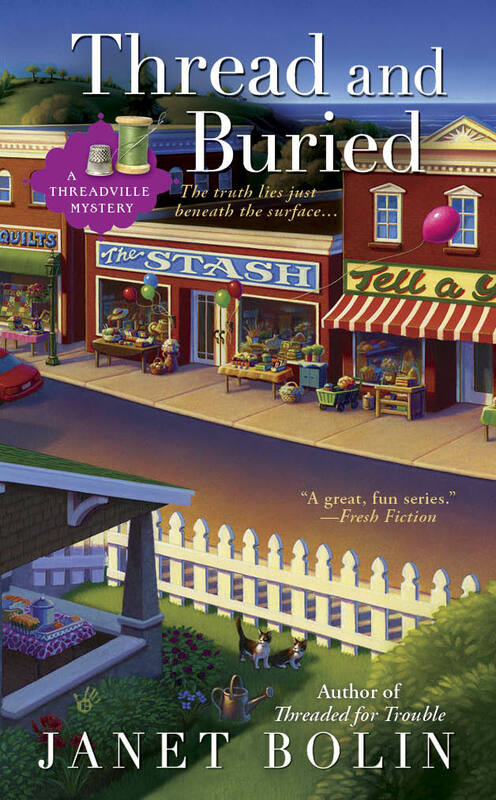 You can read about how Willow, with help from Sally and Tally, solves a murder in the latest Threadville Mystery, THREAD AND BURIED, available from these booksellers. 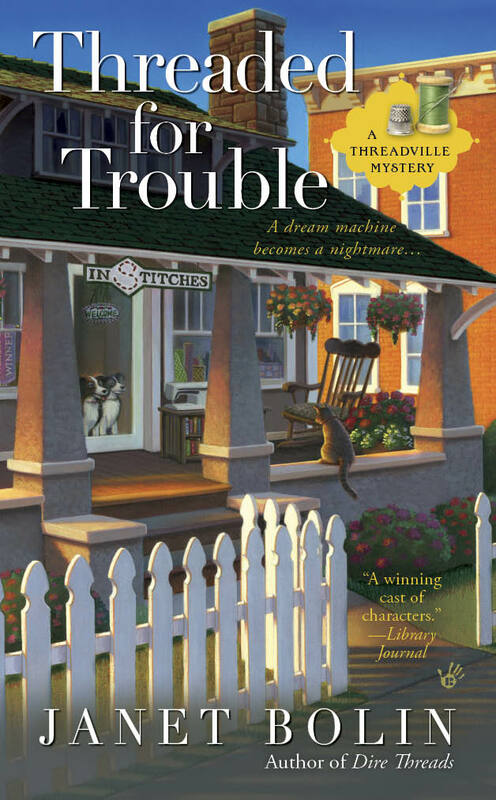 And keep your eyes open for information about the fourth Threadville Mystery, coming in June, 2014. Can't wait to start this series! I really enjoyed Thread an Buried. 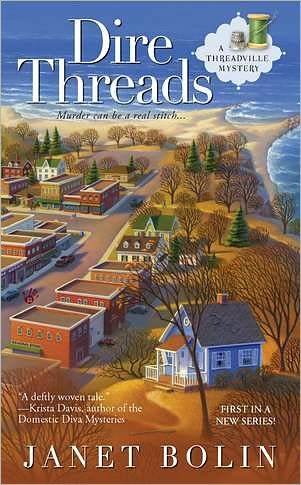 I can't wait for information on the next book! I've no doubt that you forgive Sally-Forth and Tally-Ho for behaving like curious dogs, Willow, considering all the help they give you and love you share with them! Don't worry, Zoey! They're darlings, even when they don't smell exactly wonderful. Tally smells fine again, but some of the odor is still in Sally's thicker fur. But we all love our furbabies!